I recently had reason to connect from one Amtrak train to another at Chicago’s Union Station. The type of ticket that I was traveling on gave me access to Amtrak’s Metropolitan Lounge in that train station. My layover was about five hours so I was really looking forward to finding this lounge and taking it easy for a while. 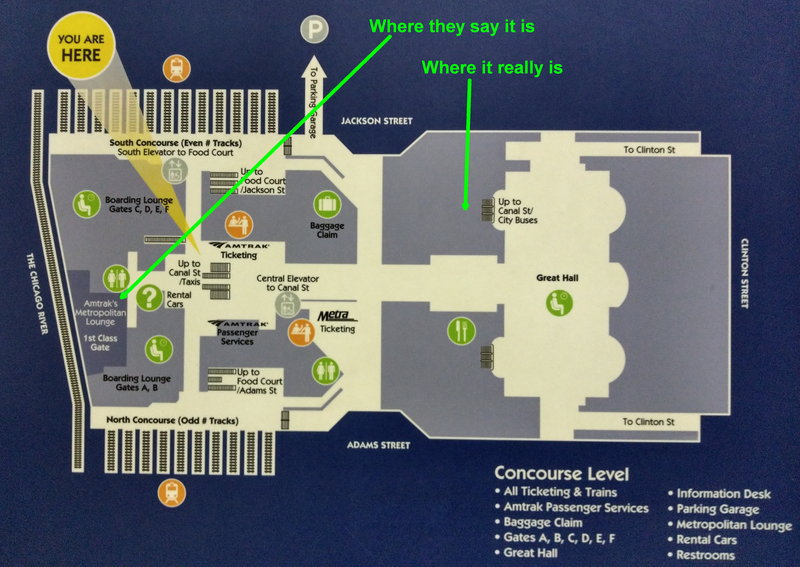 I disembarked from the first train (the California Zephyr from Denver) and found a helpful map (at right). And promptly got misdirected. As you can see on the map, Amtrak’s Metropolitan Lounge is on the lower left of the map. Except not. It turns out the Metropolitan Lounge has not been there for more than two years. The actual location of Amtrak’s Metropolitan Lounge is in a completely different location, a large gray unmarked area toward the upper right of the map. Yes, the lounge moved more than two years ago, as reported here. Later I boarded my connecting train, the Lake Shore Limited, which took me to Manhattan, where I taught this advanced PCT class. I later saw that this wrong map information is posted at over a dozen locations all over the train station. It sure would be nice if, two years after the fact, Amtrak were to update its station maps in Chicago Union Station to show the correct location for this Metropolitan Lounge. Tax dollars hard at work?